I was getting bored with my healthy egg muffins for breakfast the other day. I wanted something a little more fun and exciting and saw this egg cup bake in a used weight watcher cookbook I scored at the local thrift store. You can bake these up for your family, or just east one and freeze the rest. You will have to say goodbye to your bigger ramekins for a bit-but these are so yummy I doubt you would have those ramekins stored in your freezer for long. I went with turkey bacon to bring the points down, and some salsa to kick things up. You can probably pop in some leftover cooked veggies to get a healthy dose of vitamins and fiber too. I think this is a pretty fun basic recipe you can have some creativity with add-ins. And at 1 point each, it gives you room for some sprouted wheat toast and fruit to round out your breakfast. Spray each ramekin lightly with olive oil spray. Among the custard cups or ramekins split the sliced turkey bacon in half and place two halves in the bottom of each ramekin, lining the bottom and sides. Whisk lightly the eggs with the garlic and seasonings. Meanwhile, heat the oven to 350˚, and heat a baking sheet for 15-20 minutes while you finish prepping the ingredients. You will use the baking sheet as a baking stone, cooking the turkey bacon nicely on the bottom of the ramekins. Back to the ramekins, in each one crumble a tablespoon of the croutons and a teaspoon of the salsa. Divide the egg mixture evenly among the 4 ramekins. Sprinkle 1/2 a tablespoon of low-fat cheddar cheese on top of each. Carefully place ramekins on top of the heated baking sheet and bake for about 20 to 25 minutes or until eggs were lightly golden on top and puffy. Serve hot. 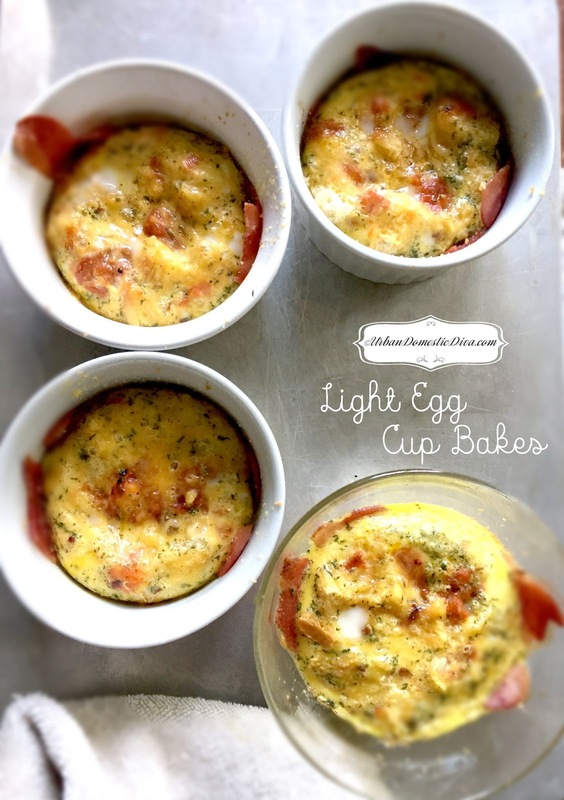 If you are a weight watcher warrior, each egg cup is 1 smart point.